The GRAMMY AWARDS slowed their decline. CBS: The preliminary 5.0 for the GRAMMY AWARDS is down 0.4 from last year’s early number (which adjusted up by half a point in finals). That drop is much less sharp than the 1.9 plunge between 2017 and 2018. The early rating for the RED CARPET LIVE pre-show is 2.3. FOX: The network’s animated trio aired new episodes for the first time since January 13, a night that had a huge football lead-in, making for inflated primetime numbers. 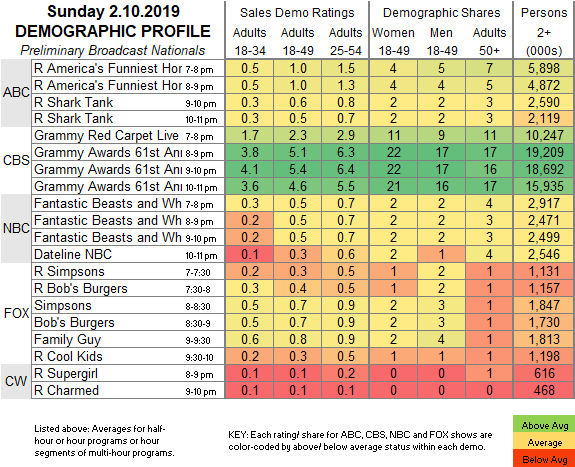 January 6 was the last normal line-up, and compared to those airings, THE SIMPSONS was down 0.2 to 0.7, BOB’S BURGERS was also down 0.2 to 0.7, and FAMILY GUY was down 0.2 to 0.8, all season lows. The night started with reruns at 0.3/0.4, and ended with a COOL KIDS rerun at 0.3. NBC: A run of the theatrical movie FANTASTIC BEASTS AND WHERE TO FIND THEM was at 0.5, followed by a DATELINE at 0.3. Tonight, CBS preempts MAGNUM PI for an episode of BIG BROTHER: CELEBRITY EDITION.